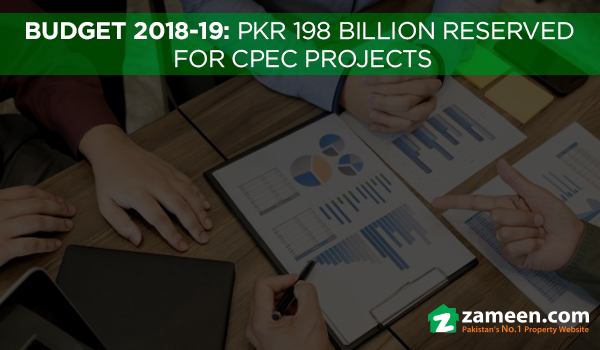 Islamabad: In budget 2018-19, an amount worth PKR 198 billion has been reserved for projects initiated under the China-Pakistan Economic Corridor (CPEC), according to a news source. Among these projects, PKR 25 billion has been allocated for the construction of western route connecting Burhan-Hakla on Motorway M-1 with Dera Ismail Khan. For modernisation of phase-1 of Pakistan Railway’s Mainline (ML)-1 and construction of a dry port at Havelian, PKR 5 billion has been allocated in the fiscal year, while the total estimated cost is PKR 380.8 billion. In addition to that, PKR 45 billion has been reserved for Multan-Lahore section of Karachi-Lahore Motorway. While for construction of Karakorum Highway’s Phase II, PKR 25 billion has been reserved. Attending to the water-related needs of Gwadar, the government has allocated PKR 150 million for five water desalination plants in the port city against the total estimated cost of PKR 3.042 billion. PKR 100 million has been reserved for upgradation of 50-bed hospital to 300 beds. To construct Eastbay Expressway, PKR 6.035 billion has been allocated, while PKR 194 million has been reserved for preparing a feasibility study on construction of breakwater. Furthermore, the government has announced PKR 625.583 for construction of Pak-China Vocational Institute in Gwadar and PKR 100 million for the berthing area’s chapel dredging.